He just locked himself into the claim that those are the guys. 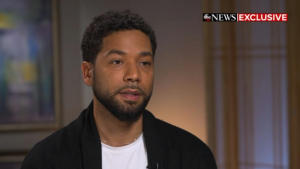 Musician and actor Jussie Smollett spoke to ABC News’ Robin Roberts in his first interview since being viciously attacked on Jan. 29 in what is being investigated as a possible hate crime. The 36-year-old, who portrays a gay musician on Fox’s “Empire,” addressed rumors and criticism that he might not be telling the truth.